The House of Delegates has 100 members. Whenever there is a tie vote, the proposal is defeated. For example, in 2019 the State Senate passed a resolution to ratify the proposed Equal Rights Amendment to the US Constitution. In the House of Delegates, which had 51 Republicans, supporters and opponents were split along party lines. Delegate David Yancey, a Republican who had been elected in 2017 by pulling his name out of a bowl after the total vote in his district ended in a tie, indicated he would support passage. Other Republicans hinted that they would too, but were not forced to cast any vote because the bill was killed in the Privileges and Elections committee. Only the members of that committee would be on public record regarding the issue. Everyone else could run in the November, 2019 elections with expressions of support for the goals of the Equal Rights Amendment but no obligation to defend an actual vote. The last effort of the Democratic minority was to change the rules of the House and "discharge" the bill from the committee. That would allow for a vote on the floor by all 100 members. The Democrats waited until the end of the session, because one seat had been empty and the political balance was 51-48 for most of the session. State Senator Jennifer Wexton had been elected to the US Congress in 2018, and then Delegate Jennifer Boysko from the 86th District won the special election to fill her empty State Senate seat the day before the regular General Assembly session opened on January 9, 2019. Another special election was held on February 19 to fill the empty delegate's seat. The regular session ended on March 3, but that one vote was crucial. The proposed rules change failed on a 50-50 vote. As promised, Del. David Yancey supported it. All other Republicans voted no. In the House of Delegates, a tie vote blocks a bill from moving forward. At the start of a General Assembly session, there is no mechanism for resolving a tie vote when initially organizing the chamber. For the House of Delegates to do business, it must first elect the Speaker of the House who determines committee chairs and members. If there are 50 Democrats and 50 Republicans, the state constitution has provided for no tie-breaker equivalent to the Lieutenant Governor in the State Senate. A 50-50 tie at the start of a session has been created once. The Democrats had 51 members after the 1997 election. Governor Jim Gilmore convinced Del. David G. Brickley (D-Prince William) to resign his seat and serve in the executive branch as the head of the Department of Conservation and Recreation. A similar offer convinced State Senator Charles L. Waddell to resign his seat, and that resignation shifted control of the State Senate to the Republican Party in 1998. These are cleverly crafted back-room deals with people who are not necessarily qualified for the jobs to which they are being appointed... He is using the appointment process for the deliberate purpose of skewing the voters' will. There were three special elections on January 13, 1998, two to replace vacant seats which were clearly in Republican districts and one to replace Delegate Brickley. Republicans won all three, but the General Assembly session had started three days before those elections were certified by the State Board of Elections. The Virginia Supreme Court rejected a Republican effort to accelerate the post-election process and get the three new Republican delegates certified immediately by the State Board of Elections. After the three new delegates were elected, the Republicans convinced the Independent to caucus formally with them. Delegate Lacey Putney had been elected first as a Democrat in 1961. He shifted his status to Independent in the late 1960's, as the conservative-liberal philosophies of Virginia's state political parties realigned to match the national parties. Thomas Moss got to remain as Speaker. As Speaker, he assigned all members to all 20 committees, but this time he had to consider the recommendations submitted by the Republicans. His assignments reflected the reality that the Republicans had half of the power in the House of Delegates, and bills on issues such as charter schools and abortion could no longer be blocked with unrecorded votes in committees controlled by the Democrats. Most committees were expanded from 22 to 24 members; the Appropriations Committee grew from 22 to 30 members. An equal number of Republicans were appointed to 19 of the 20 committees for the first time in the history of the House of Delegates. Committees were given co-chairs, and the chair rotated between members of each party. Some committee chairs switched places at the end of each legislative day, while others agreed to switch at the end of the year. Democrats lost the ability to ignore the opposition even when the Republicans offered constructive proposals. Republicans who had previously been free to simply criticize the Democratic prposals had to take the responsibility of governing. Everyone had to learn how to do business in a changed environment, though partisan rivalry remained intense. In some situations, bipartisan coalitions emerged that addressed shared regional concerns. Only the Rules Committee retained an unbalanced number of members, with eight Democrats and seven Republicans. Speaker of the House Thomas Moss appointed himself as the chair of the most powerful cmmittee in the House of Delegates. It's making lobbyists' jobs harder because they have to be nice to everybody, because now everybody's vote counts the same... There is a new dynamic, and it's going to take a while to reach an equilibrium. The conference committee which develops the final state budget was also transformed by the parity of the two parties in 1998. 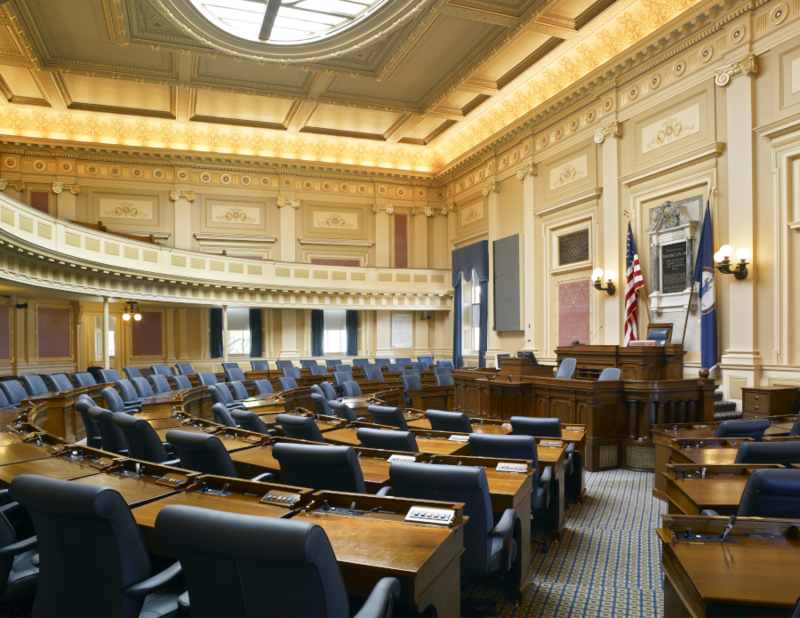 The State Senate ended up with a 21-19 Republican majority, and the House of Delegates was evenly split with 50 members caucusing with each party. The conference committee was expanded from eight to 12 members. For the first time ever, half were Republicans. The power-sharing agreement written in 1998 said it would last for four years, unless one party gained a majority of 55 seats or more. It was supposed to continue after the 2001 elections, unless one party won a majority of 53 or more seats. So What Exactly Is ‘Power Sharing’ Anyway?"